It is a tough decision for any major junior hockey player to make, but Kelowna Rockets forward Max Adolph is retiring. Adolph is ending his career after suffering six concussions in three short years. "At the time it didn't seem like the best decision, but now going to school and looking back at it, I think it was the better decision rather than risk more injuries and turning into a vegetable." The 20 year says his family, specifically his father, was sympathetic in making the decision. "I think he was the real reason I made the decision just because he has seen so much of it with his players and other players. He wants the best for me. 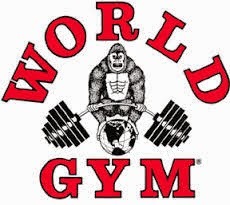 Even if I want to make a comeback I could play for his team. He was always about my health, not about hockey right". Max's father Dave is the head coach of the University of Saskatchewan Huskies. Adolph played in just 97 regular season games and missed the entire 2011-2012 season with a concussion. The Vancouver Province recently asked veteran broadcaster Dan Russell (Sportstalk is heard weekdays from 9 until midnight on AM 1150) to name the top five Western Hockey League finals ever. Russell sided with the Medicine Hat Tigers win over the Vancouver Giants in 2007, with game seven decided in double overtime. Personally, the best league championship series I ever witnessed was the 2009 final between the Kelowna Rockets and Calgary Hitmen. The Rockets were the clear underdogs despite the likes of future NHL'ers Jamie Benn, Mikael Backlund and Tyler Myers in their line up. The Hitmen were loaded with talent that season and were hyped all year as the team to beat after racking up 59 wins and 122 points. The Hitmen scored 63 more goals than the Rockets that season and had 12 more wins. To top it off, the Hitmen cruised through the playoffs with series sweeps over Edmonton, Lethbridge and Brandon on their way to the league final. The Rockets road wasn't as smooth. After a four game sweep over Kamloops in round one, the team lost the first two games against the Tri City Americans before winning four in a row to advance to the Western Conference Final. In the conference finals the Rockets were forced to six games against a Vancouver Giants team that was every bit as good on paper. Of the six games played in that series, four were decided by a single goal. After a heart attack special against the Giants to clinch the series on home ice, it was off to the WHL final against the dreaded Hitmen. Before a crowd of just over 12 thousand fans at the Saddledome in game one, Jamie Benn would score twice, once into an empty net in the two goal win. The big surprise came in game two when Mikael Backlund scored twice in a 5-2 victory. To everyone's surprise, the mighty Hitmen were down two games to none, having suffered their first two losses of the playoffs - both coming on home ice. Game three, before a capacity crowd at Prospera Place of 6 thousand 329, designated tough guy Ryley Grantham, acquired at the trade deadline for Moose Jaw, would score the game winner in a 2-0 shutout win. Mark Guggenberger made 21 saves as the Rockets took a commanding three games to none lead in the series. The series was over. Or was it? The Hitmen were loaded with talent and character, and with their backs clearly against the wall, the regular season champions won game four 6-2 before scoring another six goals in a game five 6-1 win only a night later in Calgary. Oh-oh. The Rockets were now the team in trouble as the Hitmen clearly had the momentum. 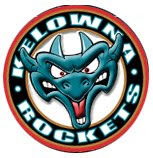 The only saving grace was game six would be played in Kelowna, a place where the Rockets had lost only twice in the 2009 post season. Game six saw the Hitmen open the scoring with a shorthanded goal before the Rockets retaliated with back-to-back second period goals to take a 2-1 lead after 40 minutes. With 6 thousand 383 fans on the edge of their seats, the Hitmen would get a power play goal from Joel Broda in the third period to set the stage for overtime. In overtime, with nervous tension in the air, Hitmen defenceman Alex Plante was penalized for hooking. With the Rockets on the power play and a face-off inside the Calgary zone, the puck would go to the half wall where Mikael Backlund would quickly pass the puck to teammate Jamie Benn, who was situated in the right corner. Without hesitation, Benn fired the puck in front to an awaiting Tyson Barrie, who snapped it past startled Hitmen goaltender Martin Jones. 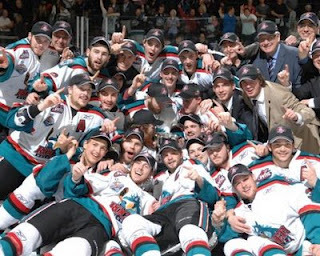 The Kelowna Rockets were WHL champions and celebrated their first league title on home ice. The teams other two titles were won on the road in Red Deer (2003) and Brandon (2005). The Kelowna Rockets have signed assistant coach Dan Lambert to a new two year contract. Lambert joined the team three seasons ago after Jeff Finley announced he wouldn't return after the team won the Western Hockey League championship. Lambert is entering his fourth season as an assistant to head coach Ryan Huska. I received a phone call in my hotel room in Edmonton from Kelowna Rockets General Manager Bruce Hamilton informing me that 15 year-old prospect Shane McColgan and his father (Shane Sr.) had arrived and were waiting in the lobby for me to conduct a scheduled interview. For a young Shane McColgan this was exciting times. For a broadcaster of the home team, it was my first chance to meet this California born hockey player that everyone talked so fondly about. McColgan would make his Rockets debut a night later in Red Deer, Alberta before eventually scoring his first career goal a night later against the expansion Edmonton Oil Kings. While still young and a full year away from playing full time with the Rockets, Shane McColgan was going to be the face of the franchise. 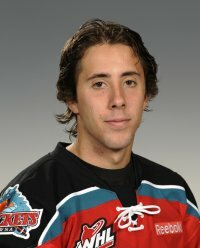 Many hockey fans in the Okanagan were holding their breath when Director of Player Personnel Lorne Frey selected the skilled forward 13th overall in the 2008 WHL Bantam Draft. The concern arose after American born Luke Moffatt snubbed the team after selecting the Arizona product in the first round - 2nd overall - in 2007. 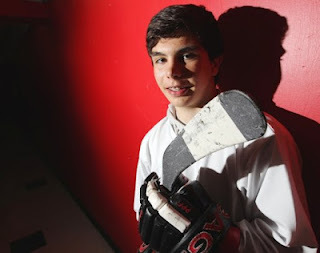 But unlike Moffatt, McColgan was committed to playing in the WHL and his first career game in Red Deer would be the coming out party for a player that some projected would become a first round NHL draft pick just three short seasons later. Shane McColgan was like any young American hockey prospect I've interviewed in the past. They are confident in their abilities and have a certain laid back style to them. It is much different than the usual shy, cautious approach that us Canadian's tend to exhibit. My first thought after interviewing McColgan was that if he was as good on the ice as he was behind the microphone, our relationship as player/broadcaster was going to blossom. Shane McColgan was fun to interview. He was comfortable with his thoughts and didn't mind sharing his opinion. He was a free spirit which made for good radio. My greatest memory of Shane McColgan was a game played April 7/2011 at the Rose Garden in Portland. It was game one of second round playoff series between the Rockets and the Winter Hawks. McColgan played arguably the best game of his career and literally was the dominant force the team envisioned when they picked him in 08. McColgan scored three goals and collected and assist in a game one win and riled up the crowd in the process. On that single night, the then 17 year-old, was a force. Did he become the player I envisioned after three seasons in the WHL? Don't get me wrong, he is a darn good player. He is a point a game guy. Unfortunately he never matched the exploits of Ryan Nugent Hopkins or Ty Rattie, two players that literally have you holding your breath every time the puck is on their stick. While he led the team in scoring in back-to-back seasons, his point totals in his third season failed to equal the career high 69 points he put up as a 16 year-old. One could argue that a supporting cast, or lack-thereof, was a reason behind the leveling off of his point totals. That is up for debate. McColgan had a quirky sense of humor. The things he said on the bus, which I won't repeat here, often made you shake your head and chuckle. He liked to make wisecracks about his teammates and was a master at it. Come to think of it, I don't remember one conversation that he wasn't involved in. He liked conversation and that may explain why he was so good with a microphone in his face. Like any player that leaves the Rockets organization, I wish him the best. I want to see these player excel no matter whether it is in hockey or in life. I don't know what scars they may have left behind them, nor do I want to know. All I want to remember is the wide-eyed kid with a full face mask taking to the ice at the Enmax Centrium in Red Deer on a cold December night trying to realize his dream of playing in the NHL. Shane McColgan's road to the big league's will take many turns. I hope he feels as fortunate as I do that his path, which for a short period of time, made it's way through Kelowna, British Columbia. You could sense Ryan Olsen had a smile on his face when I spoke to him on the phone from his home in Tsawwassen, BC. The 18 year-old was happy to be joining the Kelowna Rockets after being acquired in a WHL trade earlier in the day with the Saskatoon Blades. "I didn't know it would happen this fast. Being traded is not always a bad thing. 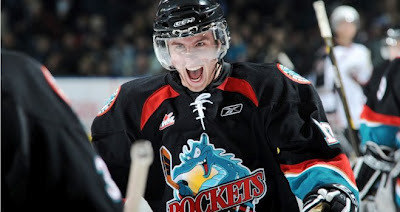 I am excited about being in BC, close to home, playing for the Kelowna Rockets. They have a good organization with great coaches and great players". What can Rockets fans expect from the newest member of the team? "I bring a two-way game. I am good offensively and defensively and I am a centreman who can play against the other teams top players. I have been known to put up a few points here and there. " Is it tough leaving an organization that will be hosting the 2013 Memorial Cup? "I was pretty excited to be a part of that team. 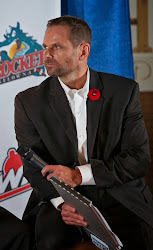 Obviously, it didn't work out so I know that the Kelowna Rockets have a great fan base and being apart of that...I am pretty excited to get going". Is their pressure to perform considering you were essentially traded for the Rockets top player? "Maybe a little bit of pressure. I thrive off pressure. I think I can help the Kelowna Rockets fill that gap. I will be expected too and I think if I play my game that it is doable". Do you know anyone of the Rockets? "I'm pretty good friends with Carter Rigby. I know him through the Under-16 and Under-17's so we became pretty good buddies. I know Colton Sissons from him just being a BC kid." Siblings: One brother who is 15 and a sister who is 14. Shane McColgan is taking the cup half full approach following his trade to the Saskatoon Blades. McColgan was traded along with Jessey Astles to the Saskatoon Blades Thursday for Ryan Olsen and two bantam picks. The 19 year-old says leaving Kelowna isn't easy, but their is a pot of gold at the end of the rainbow. "I am really exciting going forward. They are obviously hosting the Memorial Cup and hopefully this being my last year of junior, this is a good move." 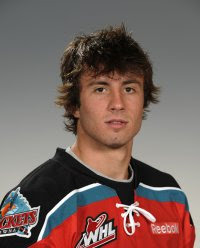 McColgan was the Rockets first round pick in the 2008 WHL bantam draft. "Saskatoon is a good fit for me. Things weren't working out for me in Kelowna. They are a great organization but it was time for a change and I got lucky with Saskatoon", McColgan added. McColgan played in 212 regular season games with the Rockets and registered his 200th career point late in the 2011-2012 campaign. The Kelowna Rockets made Nick Merkley their first round pick (9th overall) in this morning's WHL Bantam Draft. Merkley, who is from Calgary, scored 68 goals playing bantam hockey this season. 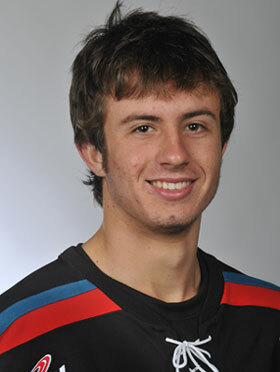 Merkley is the younger brother of Jay Merkley of the Lethbridge Hurricanes. Jay Merkley was the Hurricanes first round pick in the 2010 WHL draft. Nick Merkley has been playing hockey since he was 5 years old. He played from tyke through to Pee Wee for the Lake Bonavista Breakers and had many fantastic years with many great coaches. He was fortunate to play for the number one team for all of those years. Those teams had many tournament wins and were very competitive in Calgary minor hockey. One of Nick’s greatest strengths is his skating which he owes much thanks to Fred Sloan as Nick attended his power skating program every year from age 4 to age 12. Nick was asked by Fred to help instruct with the program which he did for 2 years. Nick also played spring hockey for many years. He played for Top Guns the following year he was invited to try out for the Alberta Brick hockey team which he made and was named the assistant captain. His team finished 3rd in the Brick tournament. The following year Nick played for the Calgary Dino’s and was named assistant captain. That team won two big spring tournaments the Canwest tournament in Edmonton and the Challenge Cup in Vancouver against very strong competition. Nick finished his spring hockey playing for Pat Elynuik and Dennis Polonich with the Calgary Jr. Flames for the last three years.This team was very competitive and played all the top teams in Western Canada. Currently Nick plays Bantam AAA hockey for the Calgary Bisons. This is his second year on the team and he is very proud to have been named captain. Last year the Bison’s AAA team won southern Alberta and lost in the best of 5 in the provincial final to SSAC from Edmonton. Nick has an older brother Jay who plays for the Lethbridge Hurricanes of the WHL and Nick hopes to follow in his footsteps.